It looks like I am going through a Body Shop phase. You know sometimes you can go without perusing the shelves of a certain store for months, even years, and then it takes one random occasion where curiosity or maybe it's boredom gets the better of you, and you decide to give it another go. Before you know it, you've been drawn back in. For me this happened a few months ago. 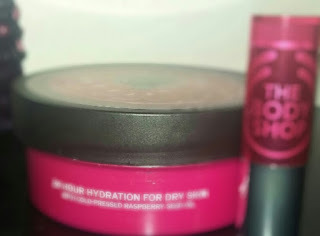 I ended up buying The Body Shop's Vitamin E body butter and as you may have seen in one of my previous posts, I was surprised by how nourishing it was to my skin. It looked and felt great. As a result, I decided to try another of the body butters and also a lipstick from the store's makeup range. 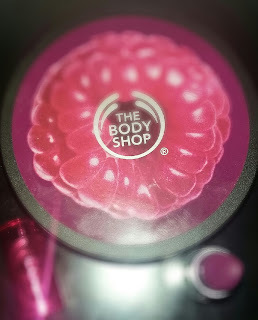 The Body Shop claims that its body butter with cold-pressed raspberry seed-oil provides 24 hour hydration for the skin. While it does hydrate the skin to some extent, I find it probably 40% less hydrating than its Vitamin E equivalent. On application, you can instantly feel the difference. This lightly-scented raspberry butter appears to be slightly more water-based, and for me personally, lacked enough oil content. That's not to say that I like greasy products. The Vitamin E body butter had the perfect blend of oil and water content, absorbed quickly into the skin and left it supple without any sticky, or greasy residue. I think this makes it great for all skin types. However, the raspberry butter, has a girly fresh fruity scent, reminiscent of spring and summer days and would be perfect for those who need a boost of hydration to their skin. This lipstick is the first product I have ever bought from The Body Shop makeup range and it has been disappointingly underwhelming. I imagined that it would be neither matte or too glossy, and that is the case on application. But, in little to no time at all the pigment fades and it dries out my lips a little. It's such an inconvenience having to top it up every two to three hours, or sooner. It's a shame because the packaging is pretty and I love the colour (it doesn't have a name).